Home | Dental Health, Patient Education, Tooth Decay | Cranberries: Teflon for Teeth? Feeling guilty for looking forward to Thanksgiving dinner? Well, don’t. Just make sure you eat your cranberries. Research indicates that cranberry juice may be beneficial to your teeth. Read on as your Reno dentists, Dr. William Wager and Dr. Brian Evans explain how cranberries may be Teflon for your teeth. Cranberry juice has been hailed as effective against bladder infections, and now it may be just as effective against tooth decay. It is believed that cranberries prevent urinary tract infections by preventing pathogenic bacteria from adhering to the surface of the bladder. In your mouth, harmful Streptococcus mutans (S. mutans) bacteria use adhesion molecules to stick to your teeth. 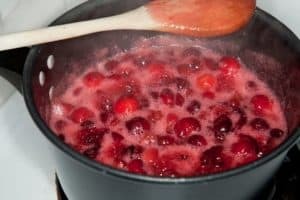 Research showed that cranberries would also prevent S. mutans from adhering to teeth, just like Teflon prevents food from sticking to the surface of anything it is coated with. Bacteria produce dental plaque by building it like a brick wall, piece by piece, using an enzyme called glucan. The research study found that cranberry juice disrupts the formation of these enzymes preventing plaque from forming. The drawback is that there is so much sugar added to cranberry juice that it defeats the benefits. Instead the sugar causes decay, and the natural acidity of the cranberries may double the effect by eating away at your tooth enamel. The study, taking place at the University of Rochester Medical Center, continues. The next step is to isolate the anti-cavity compounds in the juice so they can be added to toothpaste and mouthwash. The goal of the head researcher is to ultimately stop the bacteria that cause cavities.